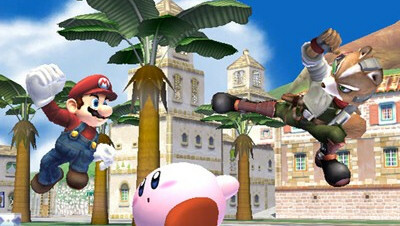 Smash Brothers fever hit this week and pretty much all of us on QSF5 are gearing up for Brawl get together next week. Forge and I tried out Brawl via Nintendo WFC, but it wasn’t as fluid it could be. The offline experience was a lot better. We’re going to give it another whirl sometime in the near future and I’m hoping it will be a better experience. My brother and I have been playing through the American version of the game at a feverish pace; trying to unlock as much as possible, but we cannot fight the urge to duke it out in Battle mode and improve our skills. I don’t believe we’re going pro like those guys featured on this week’s 1UP Show, but it’s a deep game with a lot to offer. I rarely do gaming binges, but Brawl ignited a 2 hour marathon. It seems like only Nintendo published games are capable of grabbing me like this since the last game which I spent 2 + hours consecutively with was Super Mario Galaxy. I finished Devil May Cry 4 last weekend and I’m hoping to finish the review for it this weekend. Aside from Brawl, there will be continuous marching through God of War: Chains of Olympus and Professor Layton. I’ve set Patapon down for now. For those who were wondering, I spent Thursday evening and most of today in bed today. Not sure what happened, but I was suddenly stricken with a nausea which I can only attribute to the soya milk I had just an hour or prior. I feel a lot better now though. I’ve also enabled comments without registeration in hopes to stir up more conversation. I will delete and/or alter inappropriate posts though. P.S – I’m selling off my SIXAXIS controls. EB Games is taking them for $20 a pop, but thanks to the signal dropout issue which my early ones exhibit, I’m willing to let them have it.